Click HERE for a list of Water Hoses. 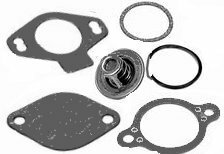 Click HERE for Complete Water Pump Assemblies. Click HERE for Water Pump Kits. We recommend the use of Perfect Seal Sealant on all "paper-type" gaskets. Do not use sealant on "composite" style gaskets. Re-tighten thermostat housing bolts after use.